Longyear occasionally receives research requests from our members and friends. 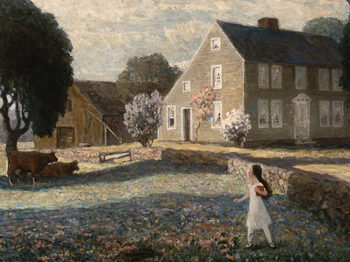 A recent inquiry brought forth research into the history of the Christian Science Hymnal, and we thought the following summary might be of some interest to our website readers. 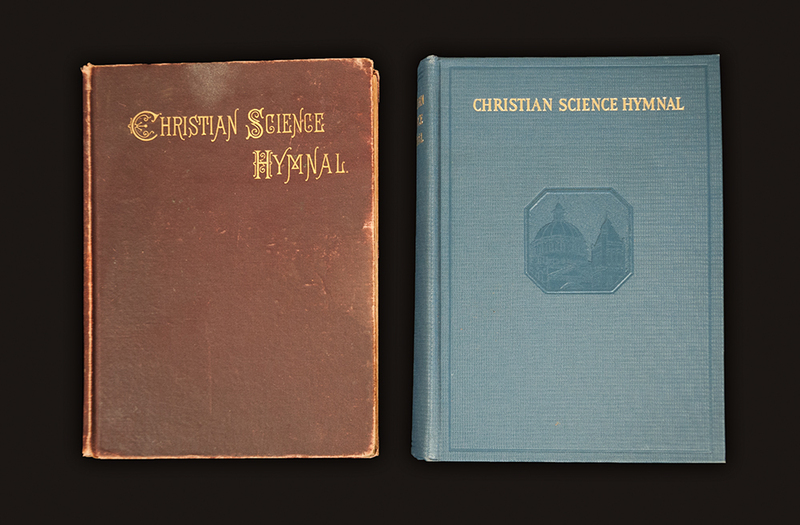 A “Christian Science Hymnal” from 1895 next to a later edition. Longyear Museum collection. 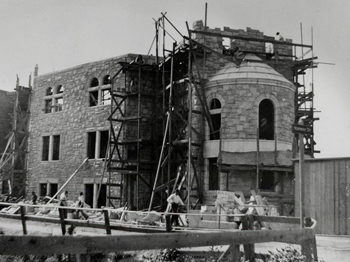 In the early days of Christian Science services, it seems the two hymnals used most frequently were Peloubet’s Select Songs and the Unitarian Social Hymn and Tune Book. In 1890, the Christian Science Publishing Society issued a words-only booklet of 17 hymn texts, and this was also used in services. 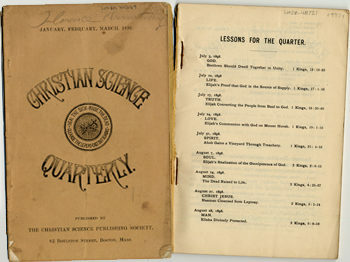 The first Christian Science Hymnal, of which Lyman Foster Brackett was music editor, was published in 1892. In this hymnal, the words were placed on a separate page from the music, according to the custom of the day. It contains 99 hymns by Lyman Brackett, most of which were written in the Gospel style, then very much in vogue. In 1898, the Hymnal was revised. Many of Brackett’s new hymns were omitted, and other hymns were added. The layout of the page was improved for easier reading by placing the words between the staves of music, as they appear in today’s Hymnal. Several enlargements of the Hymnal occurred over the next dozen years. In 1932, the Hymnal underwent another major revision. This is the edition used in Christian Science services today. A separate Hymnal Supplement was published in 2008, much of which has been incorporated into the Christian Science Hymnal: Hymns 430-603, published in 2017. For more information about the early editions of the Christian Science Hymnal, see Peter J. Hodgson’s A Most Agreeable Man: Lyman Foster Bracket, published by Longyear Museum Press in 2003. Throughout the years, Longyear Museum has developed many educational programs for different audiences. The following is a video recording of one such presentation from our archives. Titled “The Christian Science Hymnal – A History,” it was developed in the summer of 2008 for young people at Christian Science summer camps. 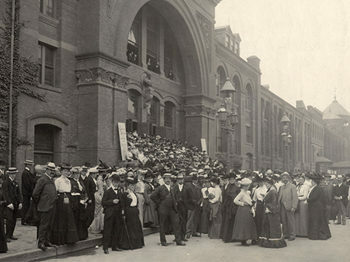 The presenters are Christina Williams (an intern at the time) and Martha Cummings (former Assistant Manager of Historic Houses). After giving the program several times that summer, Christina and Martha gave one last presentation to the Longyear staff, which was recorded in the video below. We hope our website audience finds the material presented here informative and enjoyable. 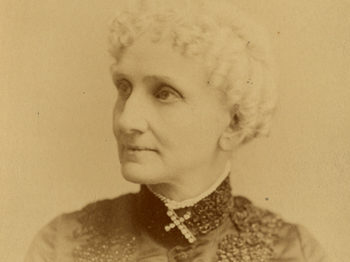 Editor’s Note: In the video, it is stated several times that Mrs. Eddy worked on her poem Christ My Refuge for 35 years; it is more accurate to state that Mrs. Eddy worked on her poem and made numerous revisions to it during a period of over 40 years (1868 to 1909).